As a follow up to our post on starting your own orchard, it is important to note the hazards that orchards can present, none of which are too worrying provided sensible precautions are taken. An apple orchard is a safe place to find apples. However, some minor hazards do exist. Think of the hazards in three separate ways: trees, apples and people. Hazards relating to the trees consist of flooding, drought, high winds, late frost, hail, floods, disease, insects, animals and humans. Apple tree branches can be peeled of their bark by hail. Without bark, insects and diseases have a quick entry to these trees. Trees must use energy towards healing instead of production – bearing apples. High winds will blow fruit off. Trees heavy with fruit can literally be torn apart by wind. Ice loads and wind normally will not affect trees because they are trimmed to bear loads. Since apple trees do not like too much water, drowning is one sure quick death. Disease, insects and animals can all be controlled by humans. Deer and rabbits are proven hazards. In the fall, deer rub trees with their antlers causing severe damage to low branches and the cambium on the main trunk. Deer will eat tender new growth in the spring, and fruit buds in the winter. Rabbits will eat the bark of the small trees during the late fall and winter months. This girdling effect to trees can stunt growth and kill trees. Humans threaten and damage trees by mechanical damage: improper spraying, improper pruning, and little humans can break branches while they climb in the trees. Most of this type of damage can be out grown in time, but the damage is real. The actual apple has a few hazards during its own development. Hazards from apple buds to apples include frost, hail, insects, disease, winds, animals and humans. An apple is the result of a vigorous, healthy growing tree. An apple is the stored energy that would allow the tree to reproduce. Weather possesses the only uncontrollable hazard to apples. Hail can destroy 100% of the crop and wind can literally blow apples off the branches. Insects, disease and animals can be controlled by the orchard manager through spraying and fencing. Hazards in the orchards to humans are limited but controllable. The process of spraying trees and fruit is one of the biggest hazards. Spraying must be done as per chemical labeling by capable people. When applied properly, the results of chemical application are safe for the applicator and the consumer of the apple. Ladders or the fall from a ladder is not recommended in any orchard while picking or pruning. The fall does not hurt; however, the sudden stop does. Bee stings are always possible when you are among millions of fragrant flowers in the spring. Normally, if you leave the bees alone, they leave you alone. Bees prefer flowers over humans. Also, overeating green apples can have an adverse affect. “Green Apple Quick Step” is not hazardous unless caught too far from the portable water closet. Overall, an apple orchard is a very safe place to be. Orchard visits are great outdoor adventures for families of all ages. The apples cannot be any fresher. The first item in the tree-planning process is, of course, selection. Many people select trees based only on their familiarity with a particular tree, neglecting to research other similar trees which may have better growth habits, higher pest resistance, greater hardiness or better landscape qualities. I would like to introduce alternatives to consider in place of the familiar trees which may be over-planted in our area. A good example is the silver maple, which is widely planted mostly because of its extremely fast growth rate. Unfortunately, with fast growth rate comes weak wood which will often break in wind, ice and snow storms. Other problems are vigorous, shallow roots which can buckle sidewalks, and a long list of disease and insect pests. If you appreciate the beauty of a maple, give the red maple, Acer rubrum, (pictured at left) a try. 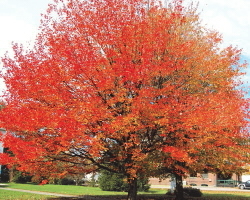 Although the growth rate doesn’t match the silver maple, the red maple is considered medium to fast growing, and is much preferable because of cleaner foliage, stronger wood and better for color. Another familiar and popular tree in the home landscape is the pin oak. Its appeal is mostly related to its strongly pyramidal, formal shape, but it is not without its problems. Pin oaks are very intolerant of high pH soils. Iron chlorosis, or yellowing of the leaves, can be a disastrous problem. Also, since pin oaks hold their leaves during much of the winter, it seems like you can never finish cleaning up your lawn if there are pin oaks in the area. If pin oaks appeal to you, but you don’t want to worry about correcting soil pH, try the northern red oak, Quercus rubra(pictured at top). Although not quite as strongly pyramidal as the pin oak, red oaks are usually nicely symmetrical, especially when mature. Red oaks are one the fastest growing of the oaks and are considered by some to be the most valuable landscape oak available. It transplants readily and is basically free of insect and disease problems. The large denser leaves and broader crown make red oak a much better shade tree than the pin oak. Another oak which is loved by many people, myself included, is the bur oak. This huge tree is one of our most majestic trees, but its use is tempered for a couple of reasons. One is its notoriously slow growth rate and another is its mature size. It simply just doesn’t fit anywhere. If you like bur oak and want something similar, but maybe a little faster, try swamp white oak. As its name implies, it prefers moist bottom lands but also has excellent drought resistance. Both the shape of the tree and its leaves are similar with the two trees. Besides the growth rate, another important difference is that swamp white oaks are much easier to transplant than bur oaks. A tree which has become very popular, and is at the point being overplanted in this area, is the Bradford pear, a beautiful spring-flowering, medium-sized tree. There are basically two problems with the ‘Bradford’ pear. The most serious one in northern Nebraska is its winter hardiness. It is definitely more of a southern tree and does not harden off soon enough in preparation for our Nebraska winters. The other problem is its tight branch crotches, which many times result in severe splitting especially on older trees. If you like the ‘Bradford’ pear, but not its problems, give Pyrus calleryana ‘Aristocrat’ or ‘Chanticleer’ pears, pictured at right, a try. ‘Aristocrat’ has wider branch angles, resulting in less splitting. The ‘Chanticleer’ hardens earlier in the fall, making it less susceptible to early freezes. The state of Nebraska isn’t known for its vast forests of conifers, except for a couple pockets of Ponderosa Pine, Limber Pine, Eastern Red Cedar and Rocky Mountain Juniper. They will grow here, but are not thought of as having endless, hardy varieties to choose from as are the flowering crabs. Over the past 25 years I’ve tried to grow several varieties of fir, spruce and pine. Some trials have shown disappointment, while others promise. This information should be especially useful now that many varieties, presently being used, have the possibility of disease problems. The following is a brief synopsis of what my conifer experiences have shown me, and hopefully will help shed some light on a few varieties in question. In this article I’ll talk about the Genus Abies, known as the true firs. In following issues I will discuss spruce, pine and a few other notables. Firs are generally native to cooler, and less extreme climates than we have in Nebraska. They dislike heavy soils, not to mention soil that accompanies new construction. The Concolor Firs has been the mainstay of the fir family. But I’ve grown to appreciate Canaan, Nordmann, Korean, Manchurian, Nikko, Corkbark, Turkish, Boris-Regis and Balsam as well. It is said that the Nordmann and Turkish Fir can withstand the wettest, heaviest soils that any fir will tolerate. I have grown these in containers, and while other conifers are dying from being over watered, these two varieties show very few losses. They are heavy in texture like a Noble Fir (often used for Christmas tree production, but not proven hardy), and display a beautiful dark, green color. Both varieties would work well as a screen or accent and compare in size to a Concolor Fir (pictured at top left). The Korean Fir (pictured at right) is known as a small garden conifer and is used quite often for that purpose in the New England states. Its needles have a green top-side and silver under-side, giving the tree a bicolor appearance. This is in contrast with the purple, upright standing cones it exhibits in late spring. It will probably mature around 30’ tall x 15’ wide. Canaan Fir (pictured at left) are thought to be a natural cross between the Fraser Fir and the Balsam Fir. It seems to tolerate the heat much better than the two varieties from which it came. I consistently see 12-18” of growth per year, even in my non-irrigated pasture where most of these trees have been tested. It’s used for Christmas tree production and has that wonderful holiday scent. It’s a relatively narrow tree, and has been used in landscapes around foundations of homes. Probably my favorite conifer at present and will attain an approximate mature size of 30’ tall x 12’ wide. Manchurian Fir is a long needled fir. As the name implies, you would gather that this tree is fairly tolerant of extreme weather conditions. After five years of growing this variety, I have yet to see a tree die, out of 20 or so planted. They aren’t only in my landscape, but in several, including a windbreak in Albion, NE. It, too, seems to be fairly moderate in growth at about 12” per year and displays a rich, green color. It’s one of my favorites. Have I said that yet? Nikko, Corkbark and Boris-Regis Fir seem to do fairly well so far. I would have to say that the jury is still out on the Corkbark Fir. It dislikes heavy, wet soil as much, if not more so, than the Concolor Fir. I just hate to give up on it because of its blue color and corky bark. It’s a cousin to the Alpine Fir (pictured at right), which is native to the timberline region in Estes Park, CO. That tells you the Corkbark Fir dislikes heat and poor drainage…but so do I and I live here. One such Alpine Fir I planted went into complete transplant shock, lost ALL of its needles, sat dead looking for a year, then sent out new growth the following year. It is now a beautiful, dense, 5/6’ tall evergreen tree. I had never seen an evergreen do that before and that’s another reason I have a soft spot for the Corkbark. The previously mentioned selections have proven to be the most durable, aside from a few other fir varieties I have tried such as Pindrow, Pacific Silver, Red, Sacchalin and Noble. I wouldn’t necessarily plant these varieties in a windbreak situation, although some are in just that, but rather use as food for thought. Just because an evergreen variety hasn’t been used, or isn’t supposed to be hardy here, does not mean it shouldn’t be tested. Didn’t people tell J. Sterling Morton that White Pine will never grow in NE? Good thing he didn’t listen. Starting an apple orchard can be a lot of fun, but will also be a lot of work. Many days, maybe even years of work may pass until you pick apples. The one constant your crop is at the mercy of mother nature. There are many variables an orchard designer has control over: site selection, apple variety, ultimate tree size and tree spacing. However, the weather, bugs and disease are working against you. If you can keep your apple trees happy, they will provide apples for you. Keep your apples happy and they will make your customers happy. When looking at a site for an orchard, seek ground that has good water drainage and does not lie low in the terrain. These low areas can become frost pockets, in other words, cold air settles in to low areas. Fruit trees flower in the spring. A late freeze will damage the flower, thus reducing the crop. Ripening happens in late summer until first fall frost. Frost/freezing can ruin the crop of those late ripening varieties. Try to choose a site that will not be a frost pocket. If you own land that could be susceptible to untimely frost, choose varieties that bloom late and ripen early. Stark Brothers Nurseries & Orchards Co. has a bloom and ripening chart for the different fruits that they sell. These charts will help determine those varieties that may do will on your site, in your region. Now, given the restraints of your site, your varieties need to be selected. After considering your frost times, both spring and fall, under-stand that not all apples varieties will grow in Nebraska. Your local nursery will have done that portion of the selection process for you. There are some 7,500 varieties in the world, 2,500 in the US, but only 100 commercially produced varieties. Pick the varieties that ripen when you want them to; August to November. Select fresh, baking, saucing or cider varieties. Opinions will vary on what is the perfect apple. Keep in consideration that some varieties of trees will have some disease resistance to Cedar Apple Rust and/or Fire Blight while others have no resistance. Another consideration is cross pollination of flowers. All apple tree flowers will need to be cross pollinated. In the typical home owners 2 tree orchard, those two trees will need to pollinate each other; in a commercial setting with multiple varieties of apples, pollinating is not an issue. You can choose apple trees of different varieties but they need to be blooming simultaneously. Crabapples can also pollinate regular apple trees. Bees can only do their part if pollen is available at the needed time. Understand, each variety of apple has slight differences in growth characteristics and vigor. These differences vary greatly in the overview of all apple varieties. With an orchard site and varieties picked, you will need to determine the maturity height you want: standard trees (20–40’), semi-dwarf (15–30’), or dwarf (10–18’) trees. A fruit tree is a grafted, asexually propagated tree. The root stock and above ground portion (scion) are of two different trees. The union of these two parts is called a graft. The degree of incompatibility in that union is the dwarfing agent. Dwarfing root stock along with the vigor characteristic of each variety will dictate the tree’s ultimate size. These factors will help determine the spacing of trees in the field. Dwarf trees may be as dense as 300 to 1000 trees per acre. Semi-dwarf trees might be 100 to 300 per acre. The higher the density, the larger the cost, the larger the harvest and therefore the larger the work load. Overly simplified, trees convert sunlight to fruit, the more sunlight captured, the more fruit produced. Modern high density orchards require more intense trimming. Dwarf fruit trees in orchard settings are easier to trim at eye level versus a lift needed to trim some semi-dwarf and standard sized trees. Dwarf trees, because of the density, will “cover” better with less chemical spray. All commercial orchards are sprayed weekly throughout the entire growing season. Organic orchards share apples with the bugs. Modern high density dwarf apple orchards require that all trees must be individually staked. Staking is not necessary in a regular and semi-dwarf orchard. Staking and training is a must to prevent the dwarf apple tree’s fruit load from breaking branches, not to mention the effects of brutal Nebraska winds. This staking or “trellis system” will cost more than the actual trees themselves. There are different methods of tree training. Your trellis or staking system will dictate which pruning system you will use. Vertical axis, vase or slender spindle are some of the high density tree training methods. Because dwarf trees start to produce early, dwarf and semi-dwarf trees tend to get planted more than standard sized trees. High density dwarf orchards are not common in the heartland due to high start up costs and low land cost. Costing 4 to 5 times more than semi-dwarf orchards, dwarf orchards are usually found on the east and west coasts where land prices are much higher. In our “pick your own” orchard setting, Trees, Shrubs and More, Inc offers a modern high density dwarf apple orchard. We have 8 varieties of apples ripening from Ultra Red Gala’s in early September to “BraeStar” Braeburn apples in mid to late October. These trees are trained to a central axis system in a single system with overhead wire and post trellis. Spacing allows for a lawn like grass bed between tree rows. At Trees, Shrubs and More, Inc., we have plenty of apples, plenty of parking and plenty of smiles.